Even with new technological advances in how we create photographs, there are still practitioners that like to hold on to the past. 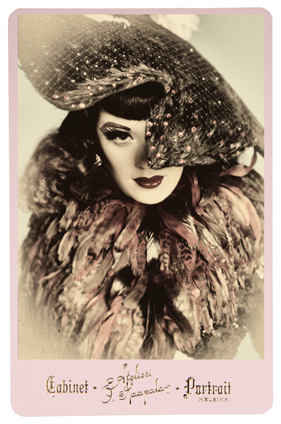 People in the photography industry refer to older photographic processes as "alternative processes." So I guess it didn't come as surprise when I saw some artists creating new art with cabinet cards. What is a cabinet card? Let's start by taking a look at what Helsinki, Finland artists Saara Salmi and Marco Melander have been creating as part of their joint studio Atelieri O. Haapala. I first met them in 2012 at FotoFest in Houston, Texas and was convinced during our 20 minute portfolio review that I wanted to own some of their cabinet cards for my personal collection as well as exhibit their work. I was intrigued -- burlesque, tattooed people and boudoir -- not something I remember ever seeing on cabinet cards in my history of photography books. That got me thinking: who else is making use of these old cards? Cabinet Cards were a popular way of presenting photographic portraits from about 1870 to 1890. They replaced the smaller carte de visite (CDV) which were about the size of a modern day baseball card. Cabinet cards consisted of an albumen photograph mounted to a board that measured approximately 4.25 x 6.25 inches. Mounting the prints made them sturdy and people could prop them up in cabinets or line them up on their mantles. Usually on the front of each card there would be the name of the studio, and on the back, a more elaborate and ornate design, including the studio name and address in a debossed script with gold, silver or black lettering -- details that Atelieri O. Haapala considered when they set out to design their own cards. San Francisco-based photographer Rachel Phillips, has been working on a series called Divinations where she looks to "make the past once again present, giving us a vicarious way to ponder the passage of our own lives." She adds her own unique imagery onto vintage cabinet cards by way of a wet transfer pigment process. 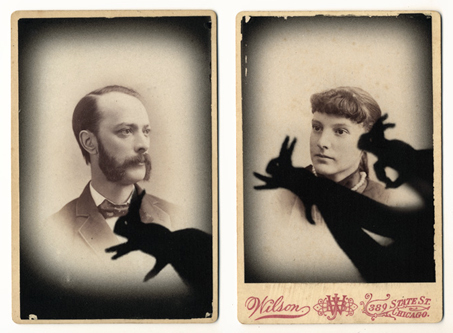 In her photograph titled, Sciomancy: Divination by Shadows, Phillips uses shadow puppets as a way of consulting with the dead. Lastly, while we continue on this subject, I happened to be walking by a bookstore in Harvard Square one afternoon and noticed something in the window. 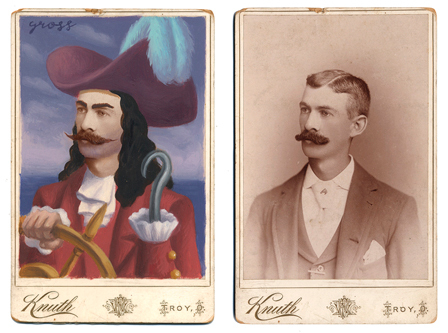 It was a book called, Now and Then: The Cabinet Card Paintings of Alex Gross. The artist Alex Gross took old cabinet cards and painted onto them -- some anonymous person from the past would morph into a fictional character such as Superman, Yoda, Spock, and even Captain America. Check out the painted version of Captain Hook next to what the card originally looked like. I counted 140 different painted cards on his website. Each one as trippy as the next. Whether they are new renditions of something old, in the way that Atelieri O. Haapala are creating their cards, or by way of up-cycling older cards and creating something new as with Phillips and Gross, artists and practitioners of photography continue to amaze me by finding new and interesting ways to keep what is old new again.